, the pious and venerable bishop of Sodor and Man, was born at Burton, a village in the hundred of Wirrel, in the county Palatine of Chester, in 1663. He was educated in the city of Chester until qualified for the university, when he was entered of Trinity college, Dublin. During his residence there he made great proficiency in academical studies, and had at first an intention of devoting himself to that of physic as a profession, but he was soon persuaded by a dignitary of the church to turn his thoughts to divinity. He continued at college till 1686, when he was ordained a deacon by the bishop of Kildare, soon after which he left Ireland, partly owing to the confusions which prevailed under the unhappy reign of king James II. ; and in the latter end of the same year, became curate of New Church, in the parish of Winwick, in Lancashire, of which his maternal uncle, Dr. Sherlock, was then. rector, and here he first displayed his affectionate and conscientious regard for the poor, by setting apart a tenth of his income (which was only 30l. a year) to charitable purposes. In 1689 he entered into priest’s orders, and it was not long before his excellent character recommended him to the notice of the earl of Derby, who, in 1692, appointed him his domestic chaplain, and preceptor to his son, lord Strange, with a salary of 30l. and he being appointed about the same time master of the alms-house at Latham, worth 20l. a ye’ar more, he set apart a fifth part of the whole for pious uses. In this situation he remained till 1697, when, to use his own words, “he was forced into the bishopric of | the Isle of Man,” a promotion for which he was in all respects eminently qualified. Being first created doctor of laws by the archbishop of Canterbury, he was confirmed bishop of Man at Bow church, Jan. 15, 1697-8, and next day was consecrated at the Savoy church, by Dr. Sharp, archbishop of York. In the beginning of April following he landed in the Isle of Man, and was enthroned in the cathedral of St. Germain’s in Peel Castle. His palace he found almost a ruin. It had not been inhabited for eight years, and nothing but an ancient tower and chapel remained entire. He was, therefore, obliged to rebuild it, and the expence, which amounted to 1400l. interrupted, in some measure, his charity to the poor, but this he soon resumed, and his beneficence ever afterwards increased with his income. About this time the earl of Derby offered him the valuable living of Baddesworth, in Yorkshire, to hold in commendam, probably as a compensation for the expences he had been at; but he declined the offer, as being incompatible with his resolution never to take two ecclesiastical preferments with cure of souls, especially when he must necessarily be absent from one of them. From this time our prelate continued to perform all the offices of a good bishop and a good man; and we hear little more of him till 1721 and 1722, when the orthodoxy of his spirit, and zeal for church-discipline, seem to have involved him in altercations and difficulties. 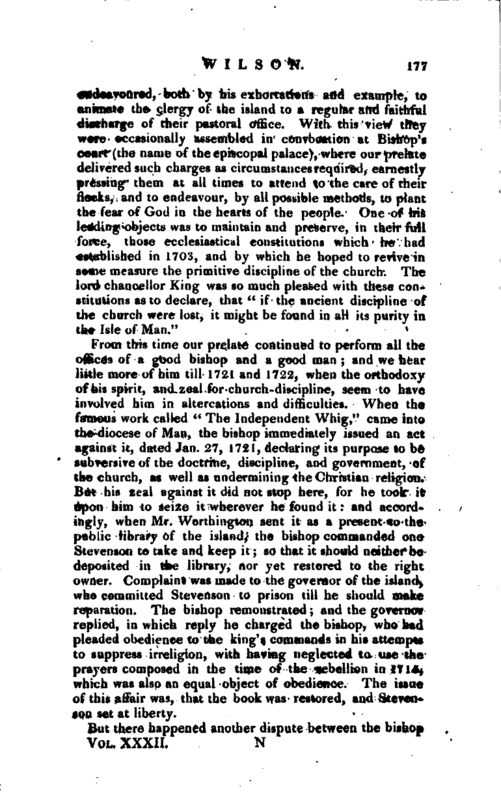 When the famous work called “The Independent Whig,” came into the diocese of Man, the bishop immediately issued an act against it, dated Jan. 27, 1721, declaring its purpose to be subversive of the doctrine, discipline, and government, of the church, as well as undermining the Christian religion. But his zeal against it did not stop here, for he took it upon him to seize it wherever he found it: and accordingly, when, Mr. Worthington sent it as a present to the public library of the island, the bishop commanded one Stevenson to take and keep it; so that it should neither be deposited in the library, nor yet restored to the right owner. Complaint was made to the governor of the island, who committed Stevenson to prison till he should make reparation. The bishop remonstrated; and the governor replied, in which reply he charged the bishop, who had pleaded obedience to the king’s commands in his attempts to suppress irreligion, with having neglected to use the prayers composed in the time of the rebellion in 1715, which was also an equal object of obedience. The issue of this affair was, that the book was restored, and Stevenson set at liberty. But there happened another dispute between the bishop | and the governor, which, so far as the bishop was personally concerned, was much more serious; and it is related thus: Mrs. Home, the governor’s wife, had defamed Mrs. Puller and sir James Pool with a false charge of criminal conversation; and, in consequence of being contumacious, and refusing to ask pardon of the persons injured, was by the bishop interdicted from the holy communion. But Mr. Horribin, his archdeacon, who was chaplain to captain sHorne, received Mrs. Home to the communion, and was suspended by the bishop. Upon this, the governor, conceiving that the bishop had acted illegally, fined him 50l. and his two vicars-general 20l. 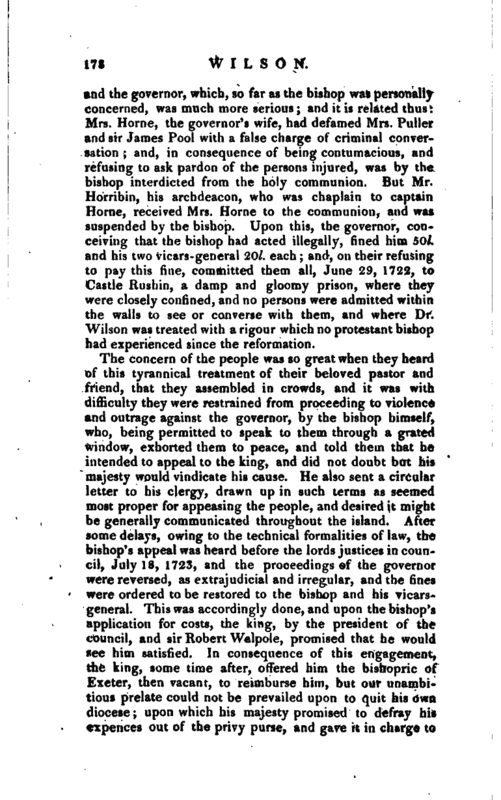 each; and, on their refusing to pay this fine, committed them all, June 29, 1722, to Castle Rushin, a damp and gloomy prison, where they were closely confined, and no persons were admitted within the walls to see or converse with them, and where Dr. Wilson was treated with a rigour which no protestant bishop had experienced since the reformation. The concern of the people was so great when they heard of this tyrannical treatment of their beloved pastor and friend, that they assembled in crowds, and it was with difficulty they were restrained from proceeding to violence and outrage against the governor, by the bishop himself, who, being permitted to speak to them through a grated window, exhorted them to peace, and told them that he intended to appeal to the king, and did not doubt but his majesty would vindicate his cause. He also sent a circular letter to his clergy, drawn up in such terms as seemed most proper for appeasing the people, and desired it might be generally communicated throughout the island. After some delays, owing to the technical formalities of law, the bishop’s appeal was heard before the lords justices in council, July 18, 1723, and the proceedings of the governor were reversed, as extrajudicial and irregular, and the fines were ordered to be restored to the bishop and his vicarsgeneral. This was accordingly done, and upon the bishop’s application for costs, the king, by the president of the council, and sir Robert Walpole, promised that he would see him satisfied. In consequence of this engagement, the king, some time after, offered him the bishopric of Exeter, then vacant, to reimburse him, but our unambitious prelate could not be prevailed upon to quit his own Diocese; upon which his majesty promised to defray his expences out of the privy purse, and gave it in charge to | lord Townsend, lord Carleton, and sir Robert Walpole, to remind him of it; but the king going soon afterwards to Hanover, and dying before his return, this promise was never fulfilled. The only recompense he had was by a subscription set on foot by the archbishop of York, amounting to 300l. not a sixth part of the expences of his application to the crown. 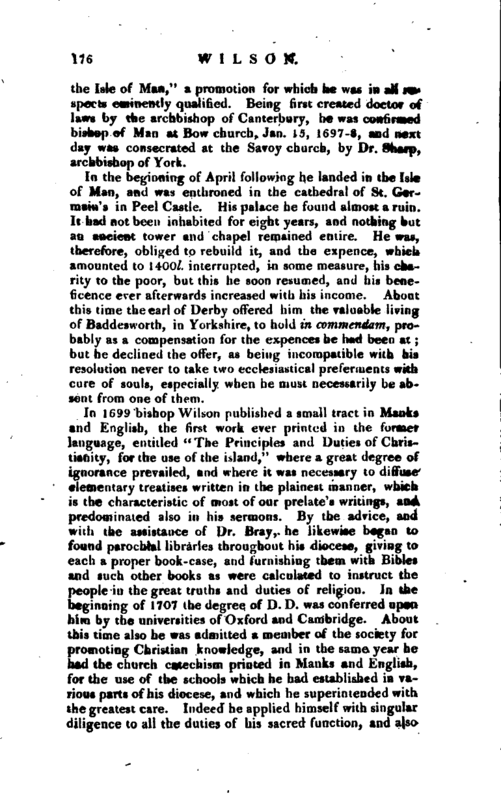 To add to the indignation which we are confident every reader will feel, ic may be mentioned, that from the dampness of the prison in which the bishop was confined by the brutal governor, he contracted a disorder in his right hand, which disabled him from the free use of his fingers, and he ever after wrote with his whole hand grasping the pen. He was advised to prosecute the governor, &c. in the English courts of law, to recover damages; but to this he could not be persuaded, and extended his forgiveness to those who had ill-used him, in the most sincere and liberal manner. After this absence from his diocese of eighteen months, which he had spent mostly in London, where he was beloved and admired to a degree of enthusiasm by all classes of people, he returned to the island, and resumed his ex^ emplary course. 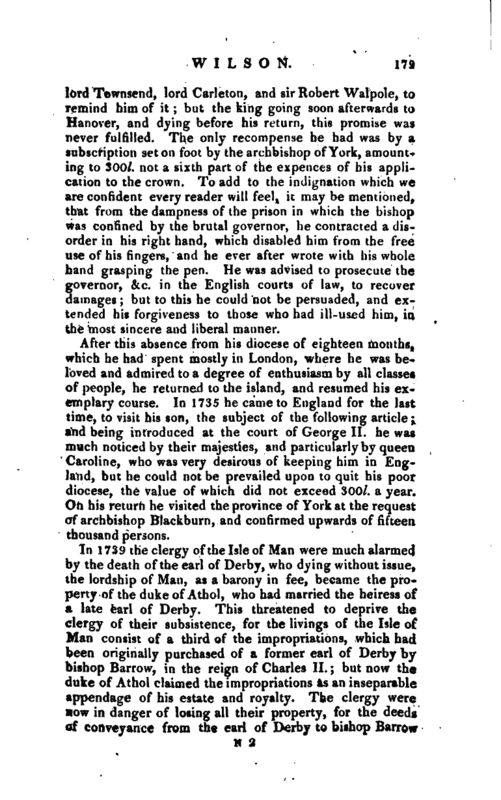 In 1735 he came to England for the last time, to visit his son, the subject of the following article; and being introduced at the court of George II. he was much noticed by their majesties, and particularly by queen Caroline, who was very desirous of keeping him in England, but he could not be prevailed upon to quit his poor diocese, the value of which did not exceed 3QO/. a year. On his return he visited the province of York at the request of archbishop Blackburn, and confirmed upwards-of fifteen thousand persons. In 1739 the clergy of the Isle of Man were much alarmed by the death of the earl of Derby, who dying without issue, the lordship of Man, as a barony in fee, became the property of the duke of Athol, who had married the heiress of a late earl of Derby. This threatened to deprive the clergy of their subsistence, for the livings of the Isle of Man consist of a third of the impropriations, which had been originally purchased of a former earl of Derby by bishop Barrow, in the reign of Charles II. ; but now the duke of Athol claimed the impropriations as an inseparable appendage of his estate and royalty. 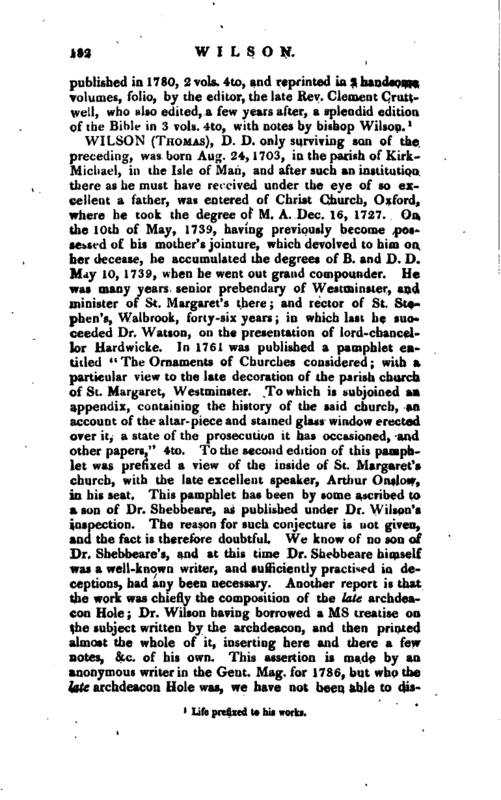 The clergy were now in danger of losing all their property, for the deeds of conveyance from the earl of Derby to bishop Barrow | were lost from the records of the island, and the affair became every year more difficult, until at length, by the care and diligence of the bishop and his son, the deeds were discovered in the Rolls chapel, where they had been deposited for safe custody. This discovery put an end to the dispute, and in 1745 the deeds were exemplified under the great seal of England, and every precaution taken for the future payment of the money. In his latter days bishop Wilson formed a plan for translating the New Testament into the Manks language, but did not live to make a further progress than to translate the four gospels, and print that of St. Matthew. This important work was completed by his successor (See HlLDES­Ley). This seems to have been the last concern of a public nature in which he was engaged, beyond the immediate duties of his bishopric, which he continued to execute to the latest period of his life, notwithstanding the infirmities naturally attending his great age. He had attained his ninety-third year, when, in consequence of a cold caught by walking in his garden in very cold weather, after reading evening prayers in his own chapel, he was confined for a short time to his bed, and expired March 7, 1755. He was interred in the - church-yard of Kirk-Michael, almost the whole population of the island attending the funeral, and lamenting their loss. 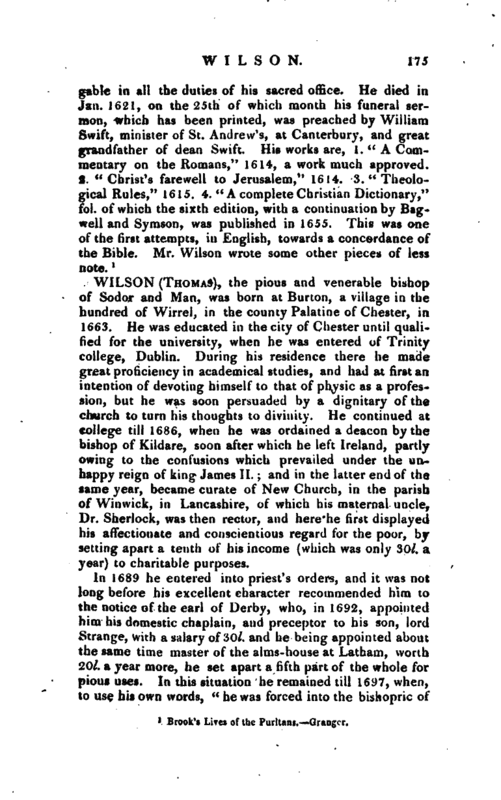 Bishop Wilson’s life was an uniform display of the most genuine and active benevolence. Considering himself as the steward, not the proprietor, of the revenues of the bishopric, he devoted his income to what he esteemed its proper use. The annual receipts of the bishopric, as we have just mentioned, did not exceed 300l. 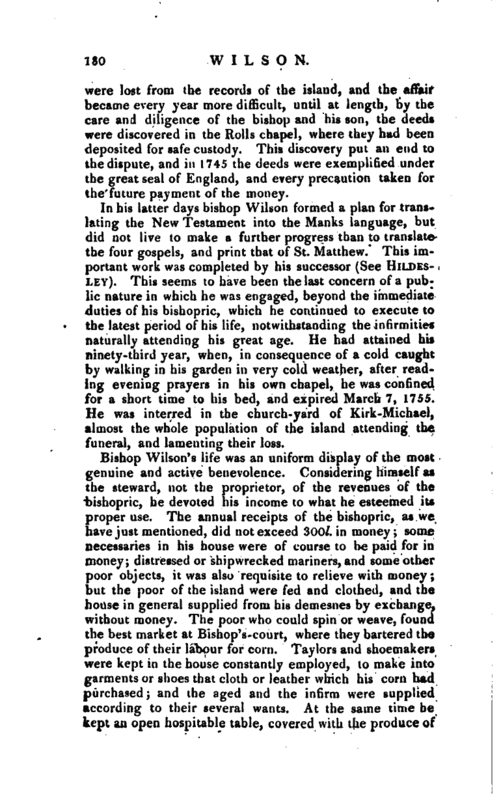 in money; some necessaries in his house were of course to be paid for in money; distressed or shipwrecked mariners, and some other poor objects, it was also requisite to relieve with money; but the poor of the island were fed and clothed, and the house in general supplied from his demesnes by exchange, without money. The poor who could spin or weave, found the best market at Bishop’s-court, where they bartered the produce of their labour for corn. Taylors an’d shoemakers were kept in the house constantly employed, to make into garments or shoes that cloth or leather which his corn had purchased; and the aged and the infirm were supplied according to their several wants. At the same time he kept an open hospitable table, covered with the produce of | his own demesnes, at which he presided with equal affability and decorum. His manners, though always consistently adorned with Christian gravity, were ever gentle and polite; and in his conversation he was one of the most entertaining and agreeable, as well as instructive of men. With these qualities of the gentleman, the bishop united the accomplishments and virtues of the scholar and the divine. He was well skilled in the Hebrew, Greek, and Latin languages; and there was hardly any part of science that could be serviceable in his diocese which he did not understand. In his younger days he had a poetical turn, but afterwards laid aside such amusements, as thinking them inconsistent with his episcopal character. During the fiftyeight years that he held the bishopric, he never failed, unless on occasions of sickness, to expound the scripture, to preach, or to administer the sacrament, every Sunday, at one or other of the churches in his diocese, and, if absent from the island, he always preached at the church where he resided for the day. He alternately visited the different parishes of his diocese on Sundays (which the dimensions of the island will permit in a carriage) without giving them notice, and, after doing the duty of the day, returned home to dinner. His family prayers were as regular as his public duties. Every summer morning at six, and every winter morning at seven o’clock, his whole household attended him in his chapel, where he himself, or one of those divinity-students whom he maintained in his house, performed the service of the day; and in the evening they did the same. Thus it was that he formed his young clergy for the pulpit, and for a graceful delivery. He was so great a friend to toleration, that the papists who resided in the island, loved and esteemed him, and not unfrequently attended his ministrations. Dissenters likewise even attended the communion-service, as he admitted them to receive the sacrament, either standing or sitting, at their own option, so that there was neither schism nor separate- congregation in his diocese. 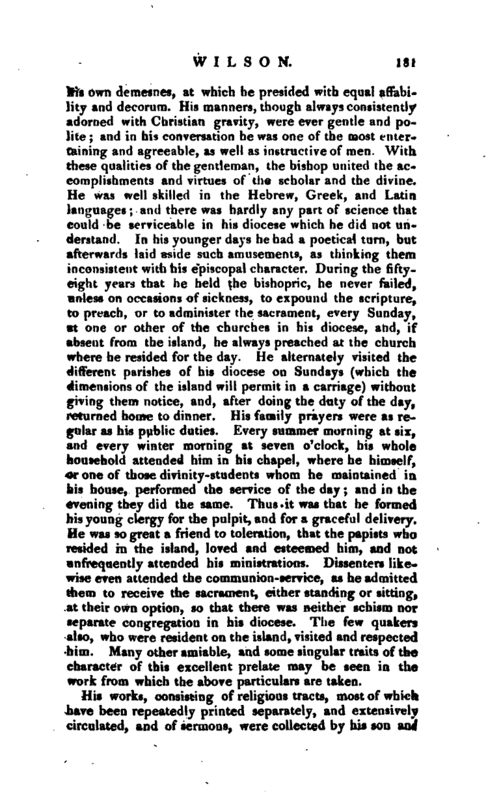 The few quakers also, who were resident on the island, visited and respected him. Many other amiable, and some singular traits of the character of this excellent prelate may be seen in the work from which the above particulars are taken. Life prefixed to his works.